Deploying and debugging your application is straightforward with Visual Studio. 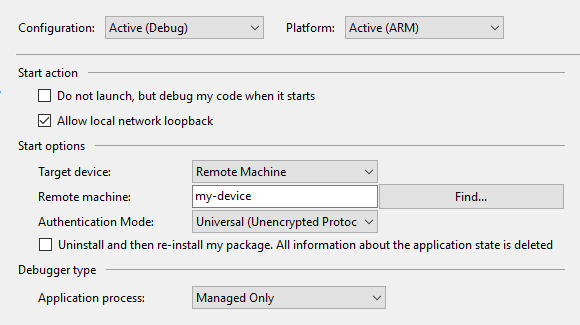 We'll use the Remote Debugging feature to deploy the app to your locally connected Windows 10 IoT Core device. Visual Studio will generate a cryptic error when deploying to a RS5 (or RS4 with OpenSSH enabled) IoT image unless a SDK from RS4 or greater is installed that Visual Studio can access. In order to use remote debugging, your IoT Core device must first be connected to same local network as your development PC. See the Connecting to a device instructions. With the application open in Visual Studio, set the architecture in the toolbar dropdown. If you're building for Minnowboard Max, select x86. If you're building for Raspberry Pi 2, Raspberry Pi 3 or the Dragonboard, select ARM. Next, in the Visual Studio toolbar, click on the Local Machine dropdown and select Remote Machine. At this point, Visual Studio will present the Remote Connections dialog. If you previously used PowerShell to set a unique name for your device, you can enter it here (in this example, we're using my device). Otherwise, use the IP address of your Windows IoT Core device. 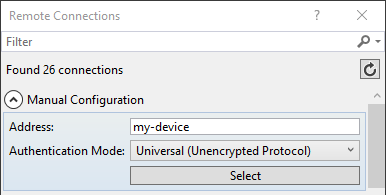 After entering the device name/IP select Universal (Unencrypted Protocol) Authentication Mode, then click Select. Now we're ready to deploy. Simply press F5 (or select Debug | Start Debugging) to start debugging our app. You should see the app come up on your device's screen. Once deployed, you can set breakpoints, see variable values, etc. To stop the app press on the 'Stop Debugging' button (or select Debug | Stop Debugging). After successfully deploying and debugging your UWP application, create a Release version - change the Visual Studio toolbar configuration dropdown from Debug to Release. You can now build and deploy your app to your device by selecting Build | Rebuild Solution and Build | Deploy Solution. With the application open in Visual Studio, set the architecture in the toolbar dropdown. If you're building for Minnowboard Max, select 86. If you're building for Raspberry Pi 2 or 3, select ARM. 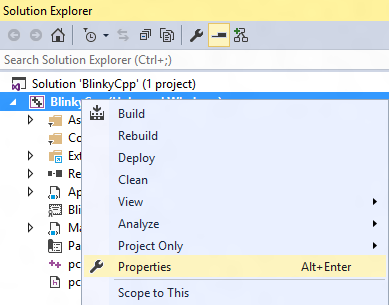 Next, right click on your project in the Solution Explorer pane. Select Properties. Machine Name: If you previously used PowerShell to set a unique name for your device, you can enter it here (in this example, we're using my-device). Otherwise, use the IP address of your Windows IoT Core device. Now we're ready to deploy. Simply press F5 (or select Debug | Start Debugging) to start debugging our app. You should see the app come up in Windows IoT Core device screen. Once deployed, you can set breakpoints, see variable values, etc. To stop the app, press on the 'Stop Debugging' button (or select Debug | Stop Debugging). Having successfully deployed and debugged your UWP application, create a Release version - change the Visual Studio toolbar configuration dropdown from Debug to Release. You can now build and deploy your app to your device by selecting Build | Rebuild Solution and Build | Deploy Solution.